Vision of torture of boys at Don Dale detention centre. Evidence of 'torture' of children held in Don Dale detention centre uncovered by Four Corners. By Caro Meldrum-Hanna and Elise Worthington. 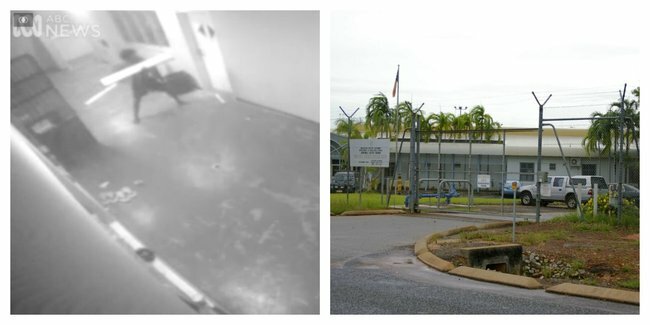 Vision of the tear gassing of six boys being held in isolation at the Don Dale Youth Detention Centre in Darwin in August 2014 has been obtained by Four Corners, exposing one of the darkest incidents in the history of juvenile justice in Australia. The vision is part of an investigation set to air tonight featuring a chilling catalogue of footage revealing a pattern of abuse, deprivation and punishment of vulnerable children inside Northern Territory youth detention centres. The tear-gassing incident was described as a “riot” at the time, with media reporting multiple boys had escaped their cells in the isolation wing of the prison, known as the Behavioural Management Unit (BMU), and threatened staff with weapons. But CCTV vision and handy-cam recordings made by staff, obtained exclusively by Four Corners, show only one boy escaped his cell after it was left unlocked by a guard. Former corrections commissioner Ken Middlebrook last year defended the officer’s actions in the wake of a damning report by the Northern Territory Children’s Commissioner. “I am not in the business of overuse of force. There were two sprays from an aerosol in the area. Now it wasn’t overuse of gas,” Mr Middlebrook told the ABC at the time. But CCTV vision from the incident shows 10 bursts of tear gas being sprayed into the enclosed area over the space of one-and-a-half-minutes. All six boys were exposed to the tear gas, five while still locked in their cells. Not all the children were misbehaving — two boys can be seen on CCTV calmly playing cards before being exposed to the fumes. Another can be seen repeatedly smashing the wall of his cell with a broken light fitting. The 14-year-old boy who escaped his cell can be heard repeatedly asking how long he had been in isolation and requesting to talk to staff. Instead of negotiating with the boy, prison staff can be heard laughing and mocking him, calling the boy “an idiot” and a “little f****r”. Four Corners has managed to track down several of the boys who were tear gassed. They describe being highly distressed, afraid for their lives, and say that two years on they are now suffering from disturbing flashbacks and nightmares from the ordeal. The CCTV vision also shows the children’s reactions as they are affected by the gas, running to the back of their cells, hiding behind sheets and mattresses, gasping for air, crying, and bending over toilets. One boy is left in his cell and exposed to tear gas for eight minutes. He is seen lying face down on the floor with his hands behind his back, before being handcuffed by two prison officers wearing gas masks and dragged out of his cell. The use of tear gas at the Don Dale Youth Detention Centre in 2014 came after months of tension, repeated escapes and incidents at the centre, which was staffed with under-trained Youth Justice Officers, in what has been described as a “ticking time bomb” by former staff. Three weeks before the tear-gassing incident, five boys had escaped from Don Dale. When they were recaptured, they were placed in the isolation wing of the prison for between 15 and 17 days, in what were described by both children and staff as appalling and inhumane conditions. They were kept locked in their cells for almost 24 hours a day with no running water, little natural light, and were denied access to school and educational material. The boys being kept in isolation were accidentally discovered by a group of lawyers, including solicitor Jared Sharp, when they were taken on a tour of the facility in August 2014. “We all sort of looked at each other in shock that there was kids in these cells, because there was signs of life in there but we didn’t know who was in there or what was happening, or how long they’d been there,” Mr Sharp told Four Corners. Human Rights Lawyer Ruth Barson said the isolation of the children was a clear violation of the United Nations Convention against Torture. In the days after the tear gassing, NT Corrections Minister John Elferink praised the actions of his staff and the prison security dog used on the night of the incident. “I congratulate again, and place my support behind, the staff who made this decision. The staff worked hard, Fluffy the Alsatian worked hard and, as far as we are concerned, it was a problem that was solved quickly,” Mr Elferink told Parliament. In the wake of the incident, the Don Dale centre was closed and the children were moved to the run-down, old Berrimah adult prison. The NT Government commissioned an independent report into the incident by former Long Bay prison boss Michael Vita, which was released in January 2015. Mr Elferink told Four Corners the Government had learned from the mistakes of the past. “It was a system that needed improvement. It was a system that had fundamental problems, which is why I’ve worked so hard to improve it and it has been improved,” he said. “That was a circumstance that clearly demonstrated to me that something had to be done, which is what the Vita Report was all about. NT Children’s Commissioner Colleen Gwynne confirmed to Four Corners there are still ongoing issues with youth detention in the Northern Territory, with many of her 2015 report recommendations still not implemented. “The response has not been as urgent as we would have liked. The issues raised in that report are extremely serious and I would like to see a more full response,” she said. For the full story watch Four Corners at 8.30pm on ABC. *Feature image Screenshot/Four Corners and Wikipedia.